I’m delighted to be publishing yet another segment of The Kitty Chronicles where Godmother Kitty drops her pearls of wisdom and passion for all things natural. This time it’s a most delicious all-natural mouthwash using primarily baking soda, water and essential oils. After trying this you’ll feel like the King (or Queen) of holistic DIY, and your mouth will be fresh as ever with a lasting yummy after-taste. There’s something quite wonderful about making your own products, all-natural, effective, and much better than the formulas used in mainstream products. Abrasive toothpastes and stripping mouthwashes can cause a condition where the inner lining of the cheek cells shed excessively. It’s a common issue caused by chemical burns, however minor, and is usually fixed by changing hygiene products. The problem is that some dental products can actually do more harm than good, causing mouth dryness, bad breath, cell death and enamel erosion. When we’re worrying about the long-term health of our mouth and teeth, it’s always best to be gentle and thorough. Use a soft brush with a flat back (no ridges), floss when you remember to and opt for herbal toothpastes that contain natural whitening ingredients. As for mouthwash, now you can make your own holistic approved formula! Add the 3 tsp of baking soda directly into the glass bottle using the funnel. If you’re using stevia, add that in next. Still using the funnel, pour in the 2 cups of water and add the essential oils as desired. We like to use about 40 drops of cinnamon for a strong flavour. Add the alcohol. Adding the alcohol directly after the oils will help remove any residue left behind on the funnel. The alcohol also helps the essential oils to mix with the water. Now for the fun part: seal the cap well and shake vigorously. Careful not to break the bottle or hurt yourself! If you don’t have a funnel you can still do it all, it just makes it easier with less potential mess if you’re not steady with your hands. Using a 35ml shot glass to measure out the mouth wash each time you use it will give you the perfect serving. When used twice daily, this solution will last 10 days to 2 weeks. A 35ml shot glass equates to 3 dessert spoons, and is another measuring alternative. To create the perfect alternative measuring unit, place 3 dessert spoons of water into desired container. Mark where the liquid sits with a hairband, rubber band, sticker, ribbon, permanent marker or any other idea you may have to create an indicator. You don’t need to use a lot of it for it to be effective, and you can easily dilute it with more water if it’s too strong for your liking, or if you want it to last a bit longer. For best, lasting results, keep the bottle out of direct sunlight and away from heat sources (radiator, fan heater, hot water tank, hair dryer, etc). If possible, find a dark bottle that naturally filters UV rays. If you can’t find one, a clear bottle will do just fine, keep it in a bathroom cabinet during the day. To ensure the mixture stays well combined, shake briefly before each use. Do not swallow. Keep out of the reach of children. Cinnamon and ginger benefits are powerful, utilised in everything from cooking to topical treatments, medicinal uses and aromatherapy practices. They’re quite similar in their qualities, uses and benefits, and compliment each other perfectly in both potency and taste. 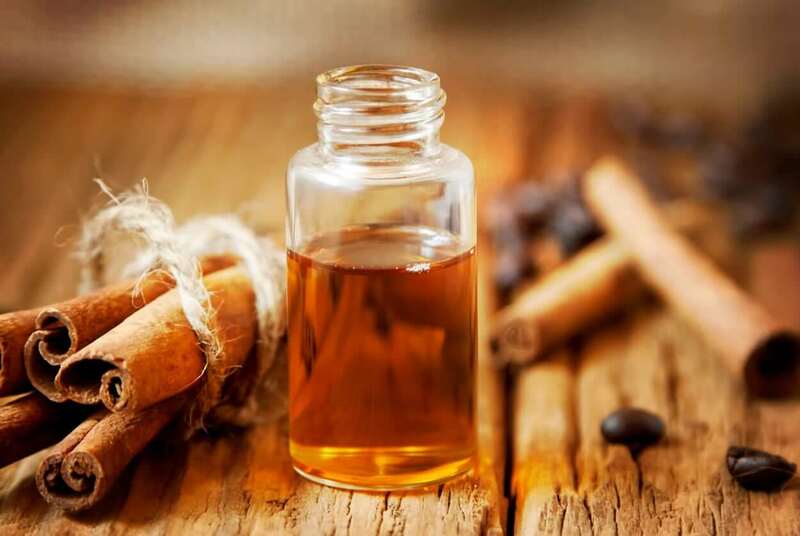 To find out more about the different types of cinnamon oil, the uses and benefits, read our “Quick fix of cinnamon essential oil” blog for everything you need to know before making your first purchase. If you’re interested in discovering more all-natural functional alternatives to replace common products, you might like our alternative hand sanitiser. A recipe which is part “The Kitty Chronicles.” If you’re loving it as much as we are, keep your eyes peeled for those one-of-a-kind blogs, just like this one! Here at The School of Natural Health Sciences we offer a selection of over 60 holistic therapy courses, among which is our diploma-correspondent Holistic Skincare Products course. Learn to make your own products with all the best natural ingredients. Find out what all those difficult-to-pronounce ingredients in cosmetic products really mean, and how they affect your body. Start to design, create, package and even distribute self-made products, as well as tailoring them to you and your clients needs.